Join Our Mailing List for your chance to win free prizes! Ron, a normal English speaking dude like most of us, recently started playing the Pokemon Gameboy Gold & Silver games. He kept a really cool journal while he was playing. We'll keep posting a little more of the journal in the days to come! 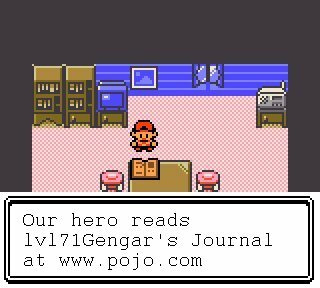 You can now send any Gold/Silver gameplay questions to Lugia and general comments on the journal to lvl71Gengar. Enjoy! Pojo.com is here to provide guidance to all Pokemon trainers out there. Whether it's the Gameboy Game, N64 or the Trading Card Game, PoJo.com provides all the wisdom you desire. If you have cool game tips, a killer deck, or breaking news ... send them to us. We'll post it on the site ... and give you all the credit. All material copyright of Pojo.com. c-1998-200This site is not associated with Nintendo, Wizards of the Coast, Creatures, or GAMEFREAK. Pokemon, Gameboy, and Gotta catch 'em all! are registered trademarks of Nintendo.